“Christmas in Special Collections,” the newest presentation by Falvey’s Special Collections staff, invites your perusal on the Library’s first floor. Laura Bang, Digital and Special Collections curatorial assistant curated the exhibit with the aid of Michael Foight, Special Collections and Digital Library coordinator; Demian Katz, library technology development specialist; and Ruth Martin, a volunteer intern in Falvey’s Digital Library. Joanne Quinn, design specialist, created the graphics for this display. “Christmas in Special Collections” fills six cases. Materials are drawn from Special Collections holdings, and the exhibit contains a wide variety of works, religious and secular, all related to Christmas. Publication dates range from 1773 through the 1970s. For this writer, the most unexpected part of the display is a book by Richard E. Byrd, Into the Home of the Blizzard, New York, 1928; a 1929 Christmas card from Commander Richard E. Byrd and the Byrd Aviation Associates and a 1928 letter on Byrd Antarctic Expedition letterhead to Mr. Dwight P. Robinson from H. H. Railey, conveying Commander Byrd’s “wishes for a merry Christmas and a happy New Year.” One wonders how these objects arrived in Special Collections. Two early periodicals for children—St. Nicholas: Scribner’s Illustrated Magazine for Girls and Boys, December 1876, and Boys’ and Girls’ Weekly Catholic Magazine, published in Philadelphia in 1846—provide an interesting look at 19th century children’s literature. 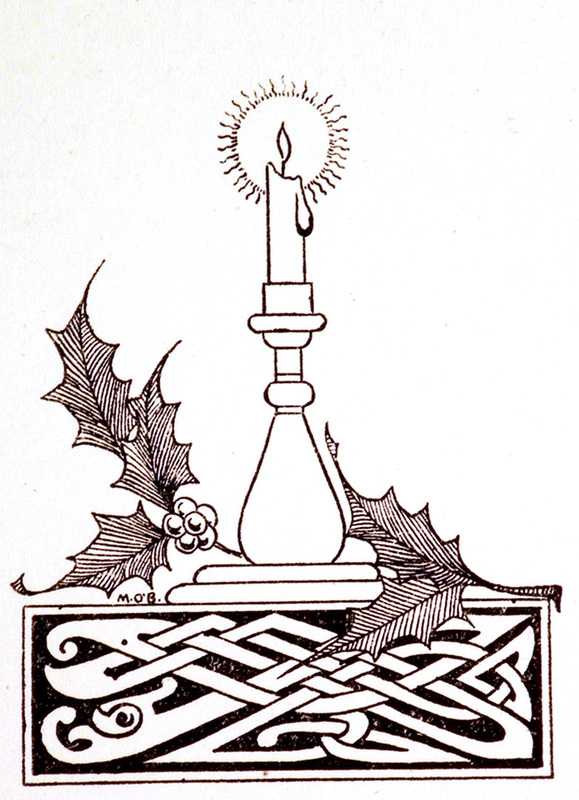 Christmas Books: Tales and Sketches, 1894, by Charles Dickens, and Washington Irving’s The Old English Christmas, 1900, present old-fashioned Christmas stories. The most visually appealing part of the exhibit (at least for this writer) is the case containing the Missale Romanum; The Belles Heures of Jean, Duke of Berry, Prince of France; The Prayer Book of Michelino da Besozzo; The Christmas Sky by Franklyn Mansfield Branlay and Blair Lent; and The Christmas Book of Legends and Stories by Elva S. Smith. Each of these books is opened to show beautiful illustrations of the Christmas story. The Missale Romanum is a Roman Catholic missal printed in Antwerp, Belgium, in 1773. 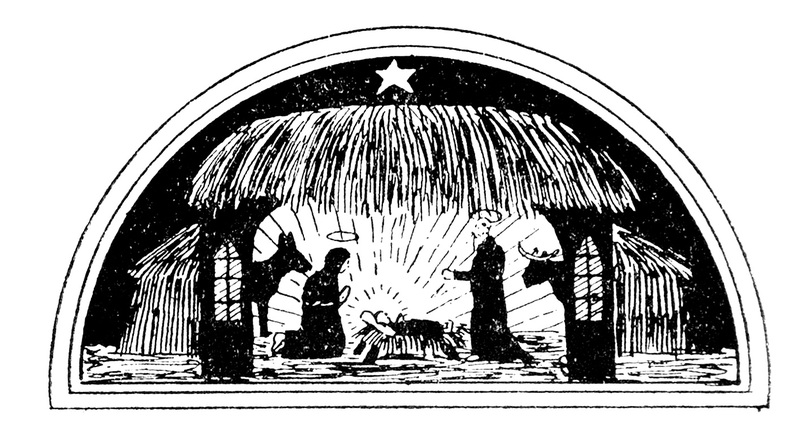 The book is opened to a full-page hand-colored illustration of the Nativity and on the facing page a colorfully decorated page with part of the “Proper Mass” for the first Sunday of Advent. The Missale contains the official texts for the Roman Rite mass. Two books in the same case are facsimiles, that is, modern exact copies of much older illuminated manuscripts. (An illuminated manuscript is a hand-written and hand-illustrated book or scroll.) The Belles Heures of Jean, Duke of Berry, Prince of France, was illuminated (illustrated) by the Limbourg brothers at the turn of the 15th century for the Duke of Berry. A book of hours is a book of Christian devotions for a lay person, the most popular type of devotional book in the Late Middle Ages. The other facsimile is the Prayer Book of Michelino da Besozzo; the original was illuminated by an Italian artist, Michelino da Besozzo, c. 1420. Look carefully at these two small books; the illuminations are incredibly detailed. In the same case is The Christmas Sky, 1966, by Franklyn Mansfield Branlay and Blair Lent. It is open to the text of Luke 2:1-7 and a color woodcut print of Mary and Joseph on their way to Bethlehem. Also in this case is The Christmas Book of Legends and Stories, 1944, by Elva S. Smith. This is open to a two-page illustration of the Annunciation to the Shepherds and the artist has included a fascinating variety of animals, not just the traditional sheep, but also a bear, a lion and a wolf. The exhibit is well worth viewing, for its religious content, for the colorful art and for the wide variety of books on display—only a small part of the treasures housed in Special Collections. Article by Alice Bampton, digital image specialist and senior writer on the Communication and Publications Team.